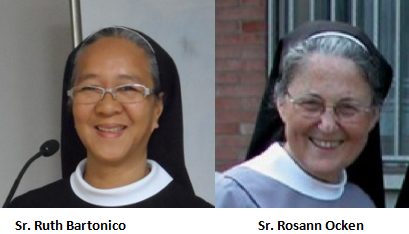 Sr. Ruth Bartonico, the regional superior and junior directress of Jinja, Ugnada was elected the new prioress of the Peramiho Priory on March 22 in the presence of Mother Angela Strobel, Prioress General, Sr. Caridad Choi, General Councilor, and the assembled delegates of the Peramiho Priory Chapter 2015. Sr. Rut is a certified public accountant by profession and has a master’s degree in Religious Studies. Among the posts she held at the Manila Priory were superior, postulant directress, school directress, and treasurer. The generalate appointed Sr. Rosann Ocken, the outgoing Prioress of Peramiho, as the new regional superior of Jinja, Uganda. She served as prioress of Peramiho for two terms. Her first term was from 2006-2012 while her second was from 2012-2015. Aside from Sr. Rosann’s gift of spiritual leadership she developed the mission in Mjimwema, Songea, establishing a kindergarten and providing a home for the orphans. She likewise enhanced the various apostolates in Uwemba and Peramiho.